Don’t you worry about the iPad lacking an SD card slot and USB port. Apple has you covered with adapters! How nice of Lord Jobs. Instead of building in two industry standards, users are forced to buy extra items with their new iPad. It’s not like the these standards are large and would take away from the oh-so-important design. But it really is ridiculous that the iPad doesn’t have an SD card slot built-in. USB port, fine. Apple is sticking with its massive dock connector, but an SD card slot — or microSD card slot — would actually open the iPad to some niche markets. Just think about photographers. The SD card slot would allow them to quickly and efficiently preview their shots on a large screen. 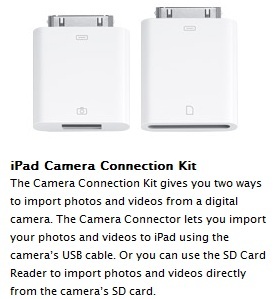 The USB port would even allow them to control some DSLRs directly from the iPad with the right app. But nope, can’t do it without an adapter. Even then, they would only be able to use one at a time because of the single dock connector. So it seems that the iPad is designed to milk every last penny out of buyers. You see, having a flush-mounted SD card slot would allow consumers to get away with buying the 16GB model and increasing the storage themselves. That’s clearly not in Apple’s financial favor, but it’s not like anyone expected Apple to look out for the buyer anyway. This is a dealbreaker for me.